By definition, there are no regions of the planet that would not be affected in some way by geoengineering. However, as the pressure from the geoengineering clique and their billionaire backers mounts, certain areas are becoming “hotspots” of geoengineering in one way or another. The area outside of Tucson, Arizona is where geoengineers have staked out plans to begin testing techniques to block the sun. At the nearby World View Spaceport, the SCoPEx project plans to float literal trial balloons that will spray sulphites into the upper atmosphere. As their techniques develop, the billionaire-backed would-be geoengineers could make the area a major staging ground for dangerous attempts to modify the global climate. On California’s coastline just south of San Francisco Bay, another team of geoengineers hope to conduct experiments to change the reflective qualities of clouds by spraying sea water. Filling clouds with salt water mist could have unanticipated long-term impacts on agricultural land downwind of the project. As with SCoPEx, the Marine Cloud Brightening Project is starting small, but operations could expand to become a global-scale climate changing operation, with implications for the region and planetwide. While not a staging ground for physical projects, Cambridge, Massachusetts is a major centre of research and advocacy for geoengineering. Harvard’s Geoengineering Research Program leverages the university’s global reputation to channel millions of dollars in funding to researchers like David Ketih, who are is also an investor in a geoengineering venture. Another plan hatched in Silicon Valley is promoting the idea of spreading billions of tiny glass bubbles across arctic ice to stop it from melting, theoretically slowing warming but also setting off a chain of unknown climate changes and ecological impacts. The Ice911 project has already begun testing its techniques on the ice in Alaska, and is planning on expanding operations to waters close to Canada and Greenland. While not the site of any major geoengineering experiments for the moment, the Sahel region of Africa is, according to many computer models, likely to be the recipient of some of the worst impacts of worldwide changes in weather patterns caused by geoengineering techniques that block the sun. Some models predict that blocking the sun could create droughts in the Sahel, which historically have been devastating in their effects. One major dry spell between 1970 and 1990 resulted in 250,000 deaths and created 10 million refugees. 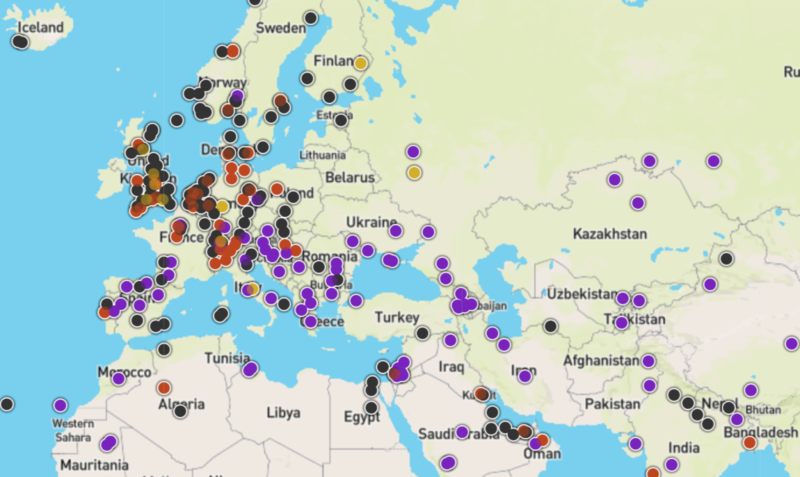 ETC Group and Heinrich Böll Foundation have produced a map of all current geoengineering projects.